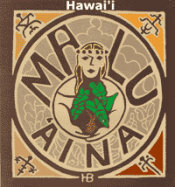 Malu 'Aina » Blog Archive » 125 Years of U.S. Occupation: U.S. OUT — Free Hawai’i Now! 125 Years of U.S. Occupation: U.S. OUT — Free Hawai’i Now! 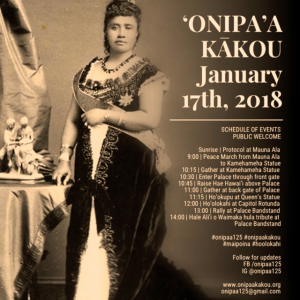 Published by jalbertini on January 10th, 2018 in Hawaii Independence, Military, Public Events, Sacred Mauna Kea, Social Justice, Take Action!, Vigil leaflets. Please pass the word on this solidarity action for a Free Hawaii — “Hawaii Loa Ku like kakou” — All Hawaii Stand Together. Mahalo. Today, occupied Hawai’i is home to more than 100 U.S. military installations, a runaway tourist industry and settler population that has turned Hawai’i into a playground for rich land speculators. Nearly 1 in every 2 households can’t cover basic needs. Native Hawaiians (Kanaka Maoli), who make up 20% of the population, now make up the majority of homeless and 60% of the prison population in their own homeland. The sacred Kanaka Maoli temple — Mauna Kea, is being desecrated and vandalized by scientific development, and 90% of food consumed in Hawai’i is now imported to what was once a 100% food self sufficient society. U.S. Out! Free Hawai’i Now!
. 1. Mourn all victims of violence. 2. Reject war as a solution. 3. Defend civil liberties.